A higher functioning person in Special Gathering wanted to know how to get in touch with a medium so that he could speak with his dead relative. 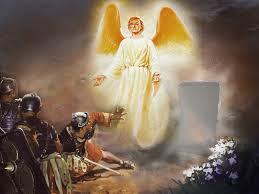 Because of the teachings in the Scriptures about angels appearing to people, he had become confused. In addition, a member had been medically dead for a very short time and he had reported that he had gone to heaven. This was my explanation to him regarding this important. Part of the problem may be a misunderstanding of who angels are. It is the popular misconception that when people die they become angels. Even though it is commonly accepted by modern culture, this is not true. And it is not supported anywhere in the Scriptures. Angels are not human beings and people don’t become angels. Angels are a separate creation by God who predate human beings. There were angels before there were humans. They are similar to humans in their form; but they are not humans. They have supernatural powers that we do not have. The Bible does not speak of angels as male or female. They appear as large, strong males most of the time. However, in modern and ancient cultural pictures, they are depicted as babies with wings or in a more feminine form. In the Scriptures, angels are given what we in the Western Culture would call male names. However, they are non-sexual because they do not reproduce. They are spiritual heavenly beings who live forever. In the Old Testament, Jesus is spoken of as The Angel of the Lord. When the angel Lucifer sinned against God (He wanted to be equal with God), he was thrown from heaven and it is indicated in the Bible that Lucifer was given dominion over the earth. It is believed that Lucifer totally destroyed the earth to such a point that God reclaimed the earth and gave dominion to Adam to “keep” (the Hebrew word used means safeguard and protect) the earth. When Adam sinned, the effect was that Adam gave dominion of the earth back to Satan. When Jesus died, he took dominion over death and hell. He reclaimed the earth for God and for man. His resurrection sealed the defeat of Satan. That is why Satan killed Jesus. Satan did not understand that Jesus would pay the price for our sin and be resurrected. When we are born, we are spiritual beings because we are part of God’s creation. God breathed into Adam a human spirit. After the fall, we are still part of God’s creation and spiritual beings but we are part of the Kingdom of Satan until we make a free-will choice to accept Jesus as our Savior. Then we are children of God. It does not matter whether we are born-again or not, attempting to speak with the dead is forbidden. Jesus told us in the New Testament that we all have an angel that is with us at all times. They are there to protect us. They are not the Holy Spirit who is our guide and teacher. These are not things that would be taught in a Sunday school class at Special Gathering. But they are things which the Bible teaches. Much of what we know about angels is found in the Old Testament. When Jesus speaks of angels and the New Testament speaks of angels, it is always in the context of what we know about angels from the Old Testament. Again, trying to speak with a dead person is forbidden. You want to stay as far away from any hints of this kind of practice.